With its delightfully refreshing lemon flavor, this Bigelow I Love Lemon herbal tea will add a little sunshine to your day. The citrusy notes of this I Love Lemon herb tea make it a delicious tea to serve either hot or iced. Pour over ice, and offer this flavor as part of your refreshing summer drink menu. Though this herb tea is naturally caffeine-free, it is made from an invigorating blend of rose hips, lemongrass, lemon peel, lemon verbena, peppermint leaves, and hibiscus. Tea and lemon is naturally a perfect pair, so this I Love Lemon tea is sure to be a customer favorite! This is a very nice smelling lemon tea. It's not too abrasive and pairs lovely with a pinch of sugar. I usually drink it in the mornings to wake me up some more, lol. The Bigelow I Love Lemon herb tea is great and so refreshing. The added lemon flavor is very zesty and smells so good while its steeping. If I could give a higher rating than 5 stars I would.We love this herbal tea. So do our Customers. refreshing Lemon Flavor. It has a Real lemon flair, not like others where they kind of taste fake. this one is really good. Taste like you squeezed a lemon right in. Really Good !!! very lemony, with added vitamin C and perfect for anyone who adds extra lemon to tea. Also great when feeling sick, and it helps ease sore throats. The Bigelow I love Lemon Herbal Tea is rich in lemon flavor and retains the classic properties of tea. It has a desirable aroma as well. The Bigelow I love Lemon Herb tea is amazing and great for all lemon tea lovers. The tea is very soothing for a sore throat and tastes delicious. This lemon flavored tea is one of my favorites. The lemon is strong but not sour and the lemon-citrus aroma is wonderful. I would order again. One of the best herbal teas around. Very refreshing either hot or cold. I usually make a pot of tea in the morning, take a cup hot, and refrigerate the rest to enjoy the rest of the day. The I love lemon makes a great cup of hot herbal tea. It has a refreshing, crisp taste that is very enjoyable. I don't like it iced quite as much however ( hence only 4 stars). Still, it is a nice tea that I do recommend, especially if you plan to drink it hot or just if you love lemon. If you love lemon, you would enjoy this tea. Very pleasant, refreshing aroma. Great tea for a great price for bigger than retail box of 28 tea bags. The Bigelow I Love Lemon Herb Tea has just the right amount of Lemon in it to make it absolutely delicious. It steeps well and can be drunk at any part of the day. A lovely blend of fresh lemon and herb in this tea that results in great drinking quality. It is so refreshing to drink and I enjoy every cup I steep. This lemon tea is fabulous. It has a great, soft lemon flavor-not too tangy. I prefer it with a little sugar or honey. It is especially good when you have a sore throat. The stand up, easy to dispense box is also very handy. 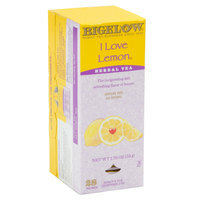 Bigelow I Love Lemon Herb Tea - 28/Box is a great Tea if you love lemon. I highly recommend if you love tea and lemon. A very potent lemon herb tea that is bursting with that fresh citrus lemon flavor. It is a very refreshing tea that can be served hot or cold. I love this tea! You do have to like lemon to enjoy it though! The lemon flavor is just the perfect amount, it's not too overwhelming which is quite nice. I Love Lemon is the perfect name for this herbal tea because the lemon flavor really shines through. Bigelow always makes a great tea product and is a great price on this site. This flavor is nice for people who want an herbal tea with a great, strong taste. As the name suggests, you should really love lemon when drinking this team. A much more vibrant and delicious flavor than any other lemon tea I have ever had. I love this lemon herb tea! Really nice citrus flavor with satisfying herb undertone! Well balanced tea which is so easy to fall in love with! Love the flavor of lemon? Like tea? Try this tea bags from Bigelow, and you won't be disappointed. Rich in taste and aroma. Quality tea bags from Bigelow. I actually don't love lemon flavors at all, but was curious about this herb tea from bigelow. I still don't like lemon, but I could tell it was a good quality tea. The perfect tea for someone with a cold or just a nice comforting, vibrant lemon flavor for anytime of day. A great and caffeine free tea from a lovely tea company. The Lemon Tea from Bigelow has been a great seller for us. People love the flavor and the aroma is very nice. I highly recommend buying. Love the lemon, love the herb. This is a great tea, i would recommend it with just a pinch of sugar in a clear glass cup. Lemon in their tea lovers will definitely enjoy this I Love Lemon flavor from Bigelow. All the flavor is there. No need to add anything to this one. Wonderful tea for cold winter days. It is caffeine and gluten free with a burst of lemon flavor. Comes nicely packaged with individual tea bags. Excellent buy. The brand Bigelow is very well known. The lemon herb tea flavor is mild to moderate and is easily flavored with honey for hot or cold drinks. I love the tea. It sells out quickly. Unfortunately, the box was smooshed, so I had to use the old box to display it in. My husband really loves this, especially these days when colds are running around. Not only tastes great but it really helps your throat feel better. Nice lemony flavor. This is a really nice tea, one of my favorites. I definitely recommend keeping this in your tea collection. Good price and good taste. This is a nice bright lemon tea. The flavor is well-balanced, and it is very well-priced. Since it isn't caffeinated, it is a tea you can drink all day and night. First off, I really do love lemon, so this was the perfect tea for me. Second, the price is out of this world. I would highly recommend any and all lemon lovers to buy this tea! While sometimes bigelow teas hit the mark this one falls short. It's still enjoyable but was expecting a more strong taste of lemon. It's still drinkable though. we carry about 20 variations of the Bigelow tea here. This is the one that is seems to remain in the box more often than other. Has a somewhat bitter aftertaste sometimes. Other teas seem to feel more soothing as being consumed. "I Love Lemon" has a very nice, bright lemon taste. It is a good, calming tea served hot, and also makes a refreshing ice tea when mixed with green tea bags. Nice bright and citrusy flavor as one would expect from a tea that is for "lemon lovers". It's great to choose when you don't want the buzz of caffeine. "I Love Lemon" is the perfect description for this tea! It has a very strong lemon flavor with herbal notes! Great for iced tea drinks!!! I Love Lemon is a refreshing tea with a strong lemon flavor. I was thinking that combining this tea with regular tea would be an interesting and tasty combination. I have not tried it, however.